Her soft spoken attribute could make many a person think of her as otherwise, but she stands as India's numero uno shooter. It's not every day that one gets to hear of a 23 year old girl turn down offers from multi-national companies and pursue her passion. In February 2017, she won three gold medals at the international level shooting championships. 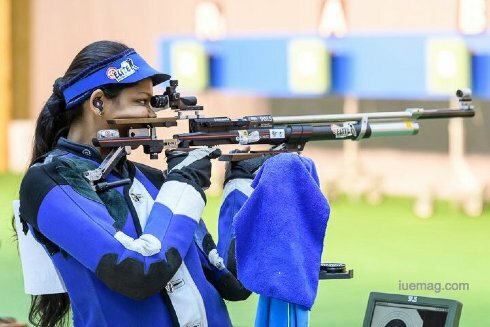 She also has won the gold at National level shooting tournaments too. Meghana Sajjanar, a computer science engineer by qualification, entered the national foray for the first time only at the time during which her fellow sportsman Abhinav Bindra was busy rewriting record books. "I got hooked to shooting after watching my brother in action at the SAI range. When we started there was no one to guide us and the facilities were poor. Now it is much easier as everything is transparent", Meghana says. She has been trained at 10m Air Rifle and 50m Rifle 3 positions. ‘10m Air Rifle’ is shot over a distance of 10 metres (10.94 yards) from a standing position with a 4.5 mm (0.177 in) calibre air rifle. ‘50m rifle three positions’ consists of the kneeling, prone, and standing positions, fired in that order, with 3×40 shots for men and 3×20 shots for women. The calibre is .22 long rifle (5.6 mm). “Owing to expensive equipment cost in the latter, I currently train much in the 10m category”, she adds. Meghana has taken part at the national level for about 8 times. In December 2016, she bagged gold at the Nationals. The next month, she aced the selection trials, held for the World Cups. She also took part in the international level competition, ‘InterShoot’ in Netherlands. She won three gold medals individually and another gold with her team. The highlight is that, these came on three consecutive days. She played her first World Cup in New Delhi, in which she finished 16th. The second World Cup in which she featured was Munich, 2015. She stood 15th in that. In the qualification trials for her third World Cup, at Azerbaijan, she stood first, while she finished 4th in the finals. She missed out on a podium finish unfortunately to a tie-shoot loss by a narrow margin. Competing in her maiden final, Meghana was second after 18 shots but soon lost her way as she came up with 9.8 on her 20th after a 10.2 in her previous try. The poor last shot masked all her good work as she was forced into a tie-shoot with 2015 Asian champion Xiang Wei Jasmine Ser of Singapore. Having always been a girl into sports since childhood, Meghana also was into athletics and basketball amongst others. “As I stood watching my brother stand in the range and fire, the sight of rifle and the sound of the bullets amused and enticed me” quips Meghana. What started out as merely a hobby has taken her to great heights, and she’d only ascend further. Picking up the rifle at the age of 12, availability of good coaches initially was a problem. But the presence of helpful seniors not only boosted the morale, it also helped her win a silver and a bronze medal at the 2012 Junior Championships team events. Meghana also has the distinction of having shot the perfect score of 400/400 at the state meet. She finished her engineering in 2016 and got placed at Cognizant. Feeling that the 9-6 work timings may hamper her shooting practice, she opted not to join the multi-national company. 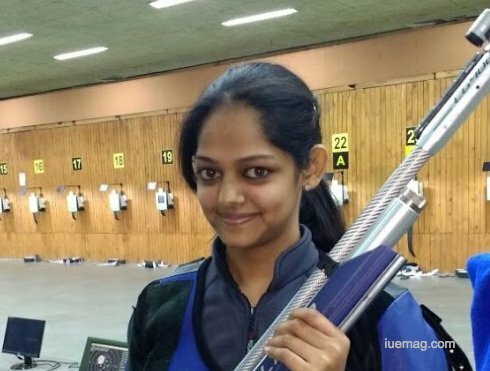 “This gave me the whole day to concentrate on shooting and I could train myself better and improvise on many other aspects that are very much required by the sport, I could work even more on my fitness and strengthen myself mentally”, she says. “Shooting, being a sport demanding high levels of accuracy, makes anxiety creep into a player’s mind. It is in our hands to allow or not allow it to soak into us. Decimals are used to decide winners, which shows us that one small lapse in concentration can prove costly. Being composed, in any situation helps give the best when required”, Meghana sums up. This is a quote by the great A P J Abdul Kalam Sir which reflects the dedication and hard work of Meghana. India’s No.1 currently, she definitely is working hard every day and is pushing herself to conquer higher zeniths. The World No.1 title would just seem a few steps from her, given her zeal. If you know of a sportstar or an adventurer, rising or a phenomena, do not forget to connect them to us by any means you can. We would love to learn their story of Unlimited Inspiration & share it with our readers across the globe. Any facts, figures or references stated here are made by the author & don't reflect the endorsement of iU at all times unless otherwise drafted by official staff at iU. This article was first published here on 10th July 2017.